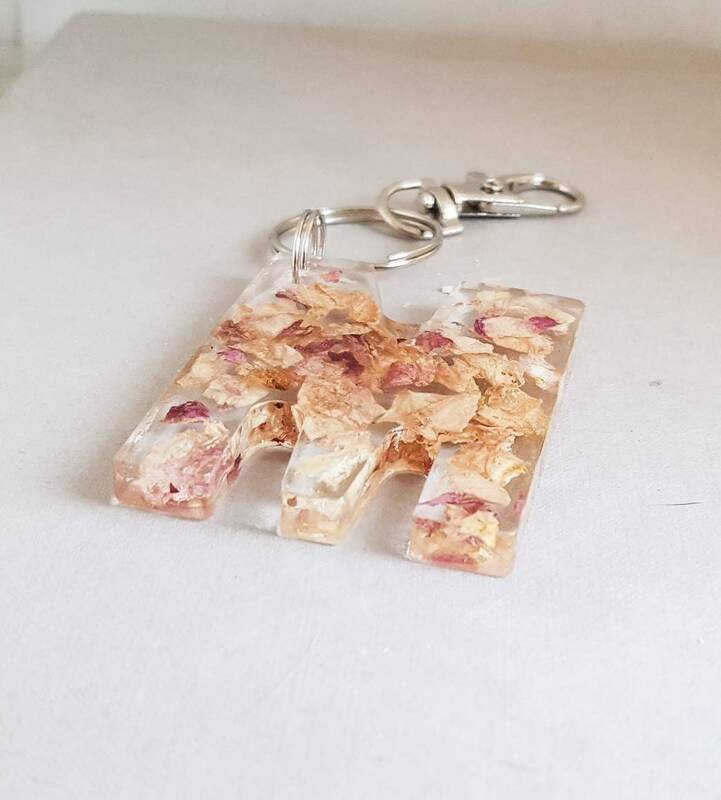 This initial keyring is made using layers of resin and real cream and pale pink Rose petals. This Rose petal keyring measures 5 cm long approximately 3 cm wide (slight variance for some letters) and approximately 0.5 cm thick. This large letter keyring would be a great gift for that special someone who likes to stand out from the crowd. This Rose initial keyring could be given as wedding favours. If you require a different colour, just send me a message and I will do my best to find your required shade. 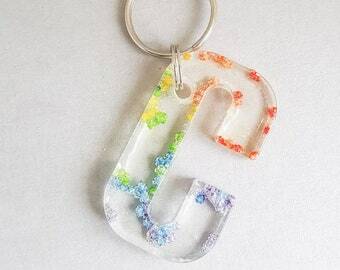 This initial keychains can be attached to your purse and worn as an flower bag charm. If you are looking for a monogram gift to give as a stockig stuffer, this letter bag charm has an original style. This flower keychain will arrive in a stylish black gift box. You can see the shape of all of the letters that are available, in the last photo. This item has broken within a few weeks of using it from simply being in my handbag. It's really pretty so I'm really disappointed. I also bought one for a gift and now I'm nervous theirs will break too. Very unique piece. Just treat it delicately as I dropped my keys and broke a piece off. Payment should be made within 3 days of committing to buy an item, If payment is not received within the 3 day timescale, the order will be cancelled. I want you to be satisfied with all of the items you purchase from my shop. I will offer a full refund if you are not happy with your item. Please contact me within 14 days of receipt to inform me that you wish to return an item. The item must be returned to me within 14 days of receipt, and be in the original packaging and original unworn condition. Outward postage costs are refundable, but return postage costs are the responsibility of the buyer. If the item is faulty you have 30 days to return the item, both outward and return postage costs are refundable in this situation. All refunds will be reissued onto the original method of payment, once I have received the item. Proof of posting is recommended in this situation. Earrings can not be returned due to hygiene reasons. All items will be shipped by 2nd Class Royal Mail Signed For on UK orders, and Air Mail for international orders. Orders will be dispatched on receipt of full payment. Postal upgrades are available at the checkout. International shipping can take between 10-14 days, but it can take longer due to customs and security checks. If you are concerned about how long your item is taking to arrive, please get in touch with me. It is the buyer's responsibility to for any additional Customs expense, and to clear the parcel through their particular country's Customs. I will fill in a declaration form with the items value and marked as not gift. I like to recycle postal packaging where possible, if you would prefer a new fresh envelope, please contact me when paying for your item. My workshop is pet and smoke free. If you have any problems with your order, please don't hesitate to contact me, and I will do my best to resolve the issue.